I just got my first batch of scans back from ScanCafe. I’m uploading about 2GB worth of images to Flickr right now. I think it’s going to take a while. 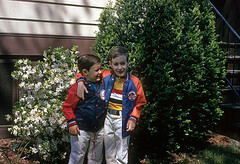 Here’s a nice photo of me (in a Mets jacket) and my brother Mike (in a Yankees jacket).